In today’s world, it is a prevalent trend to add the prefix of sustainability to most things. However, there seems to be very little that is done to represent the concept. 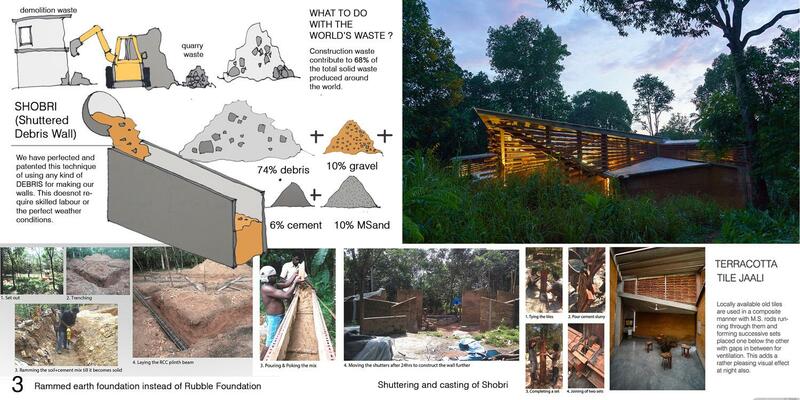 We, as a community, have devoted ourselves to the cause of using Mud and Waste as the chief components to make structures which are alluring and utilitarian. As a firm practicing sustainable architecture exclusively for a decade, we know about the aspirations of a “modern” client, where his house is a symbol of his status and prominence in society instead of being a statement for the future. When we first met the client, he mentioned to us about his disapproval towards the traditional Kerala style home system. 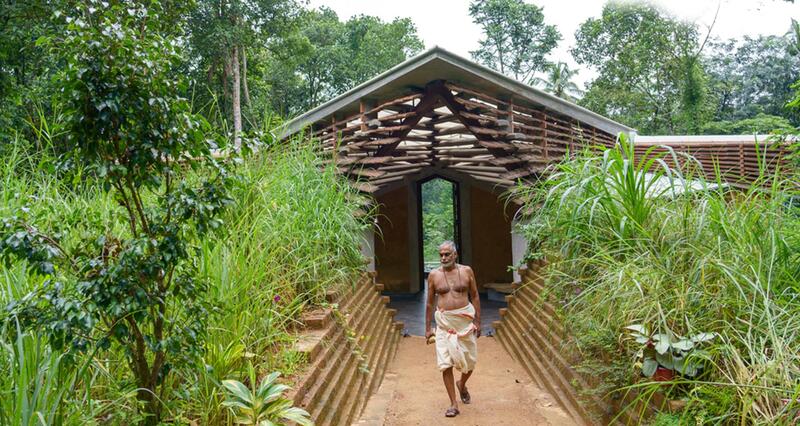 The traditional houses in Kerala are typically sloped roof structures with heavy overhangs. Although the roof prevented rain and the cooling was phenomenal, he was deterred by the atmosphere of darkness which stayed prevalent or was associated with the ambience inside the house. The second altercation was that many of the architectural systems that were in place promoted gender inequality in the olden days since women were restricted to the courtyard. Thus during the early days of the project, the client had made a point that the house should be a symbol of a new light, or a new outlook to our age old systems and beliefs. “Chirath” which denotes a traditional lamp in Malayalam is the name given by Mr. Ramanujan Basha for his house at Pala, Kerala. The client, thus asked for a solution by throwing away the bad and utilizing the good. “Bring in the sun, but not the heat. Bring in the rain, but not the leak. 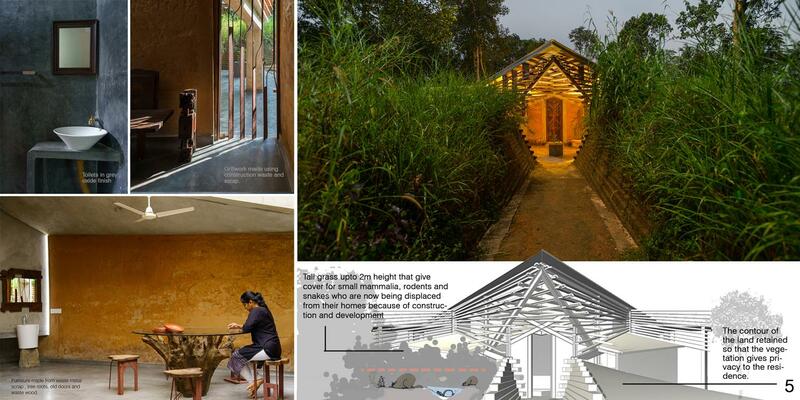 We decided to break the roof, split it open and let the light flow in, all while using waste and mud to build the house. This is the concept of Chirath. What is waste? Waste can be classified as anything that was produced, used and then discarded from its original function. While the work and construction process results in the production of a lot of scrap, we believe in not being deterred by this demon and instead have learnt to build with it. 3. Terracotta tile jali – Locally available tiles are used in a composite manner with ms rods running through them and forming successive sets placed one below the other with gaps in between for ventilation. 4. Waste wood – plained and cut into long pieces, and joined to make furniture like bedsead, kitchen cabinets, chairs, etc. 5. Scrap for window grills – Waste steel rods and ms plates are put to use beautifully as window grills, and ventilators. 6. Ferrocement walls and slabs – Partition walls in toilets, kitchen slab, and seating in living area are made of ferrocement. 7. Oxide – Floor and selected walls have been finished with grey and white oxides. • Pond – The pond in the living area aids in evapo-transpiration and helps in passive cooling. 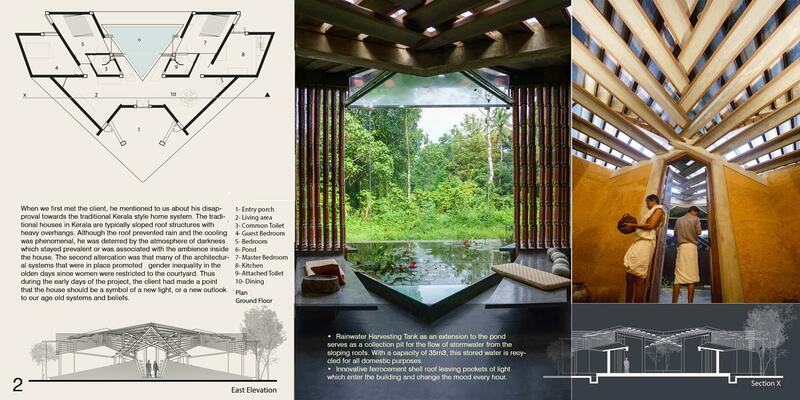 • Rainwater Harvesting Tank as an extension to the pond serves as a collection pit for the flow of stormwater from the sloping roofs. With a capacity of 35m3, this stored water is recycled for all domestic purposes. 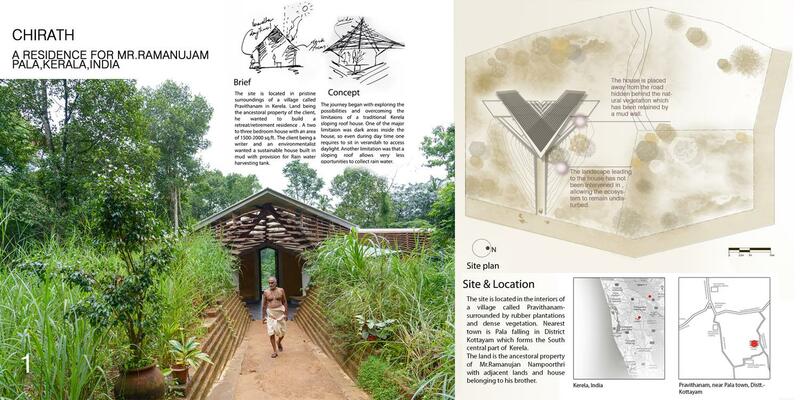 • Innovative ferrocement shell roof leaving pockets of light which enter the building and change the mood every hour. • Reinventing the use of terracotta tiles as jali on the exterior walls. 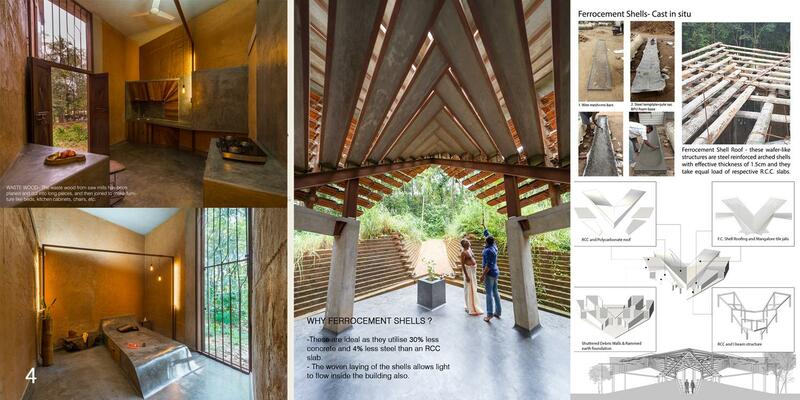 • Well amalgamated interiors and exteriors, which allow peaceful transition into spaces.